The use of color in Long John has already been a focus for the page notes enough to not warrant a reiteration, though those principles still stand. However, I would like to point out a specific use of color not previously discussed. 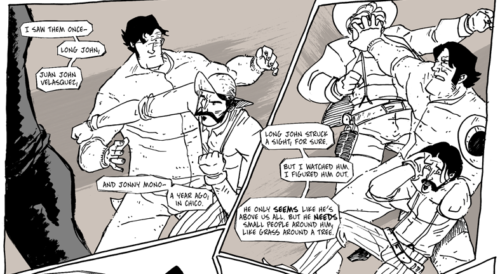 The last fight scene occurred back in Chapter 1, when Long John got the tar kicked out of him after showing up in Poverty Flat wearing another man’s coat. The scene took only a single page, though the choices in that page established the lexicon of violence for this series that I came back to a few times. The fight scene from Chapter 1. As stated on the previous page, I want the violence in this comic to be very obvious, clear, and brutal. 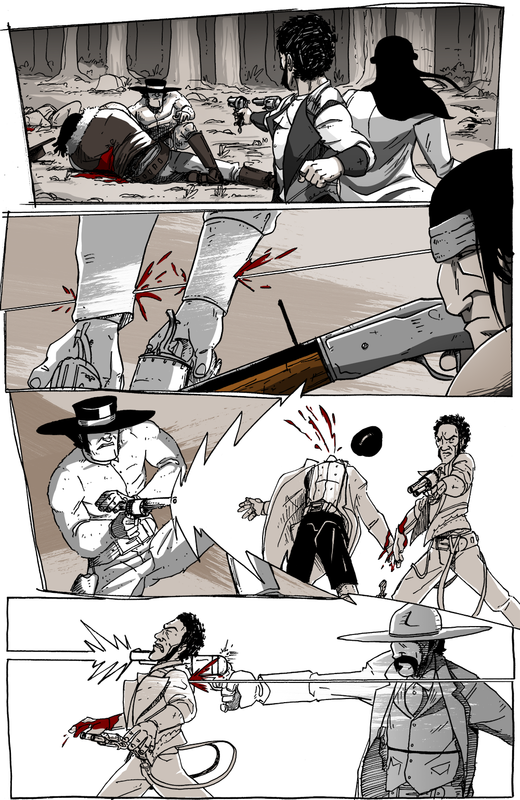 Such was the case when I drew and colored the fight page in Chapter 1. In the lineart, I dropped the backgrounds to focus on the interaction of the figures. With the colors, I found a method to draw that focus even more. Back when Chapter 1 was reviewed by the Panda Manga’s Geek Life podcast, one of the artistic critiques they had about the book specifically argued against the colors of the fight scene in Chapter 1. I didn’t begrudge their opinion; in fact, it bolstered my faith in the choice I made because it did draw their attention and, clearly, made that page––and, by proxy, its violence––uncomfortable for the reader. So, their critique actually made me happier with how everything turned out. At the beginning of the fight, Long John is in control, so he sees everything clearly. Since I wanted to pull the focus completely toward the brutality of the violence occurring, I tried to do the same with the colors. 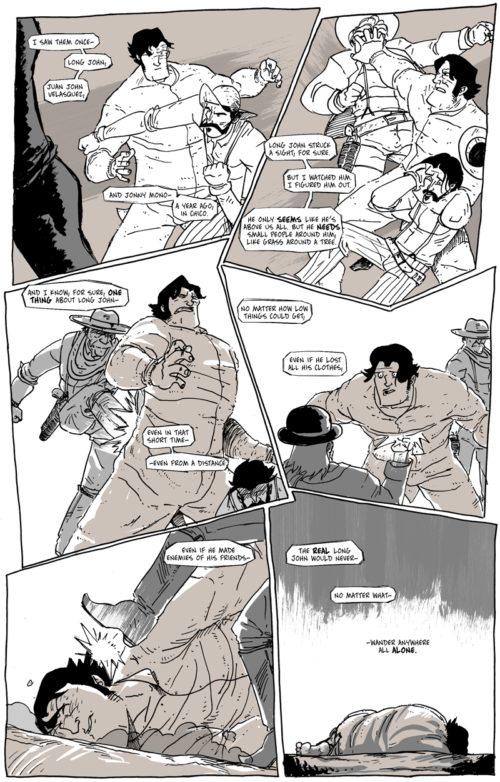 If we look at that first fight scene, the first two panels have the figures in pure black and white––no shading or coloring. Those are also the only panels where Long John is in control of the fight; as soon as the mob gets the upper hand, the coloring changes specifically to enhance the actual violence––the punches, the kicks––at the moments of impact. When he loses control in the fight, colors shift focus from his point of view to the moments of violent impacts. I really like how it turned out even though it could be a jarring experience for the reader. Again, that’s what I wanted. I kept this technique in the back of my mind since Chapter 1, wanting to use it again when a fight scene returned some day. And though I tweaked it a little bit––and the violence in Chapter 3 is much more dire and deadly––the premise behind its artistic expression remains the same.